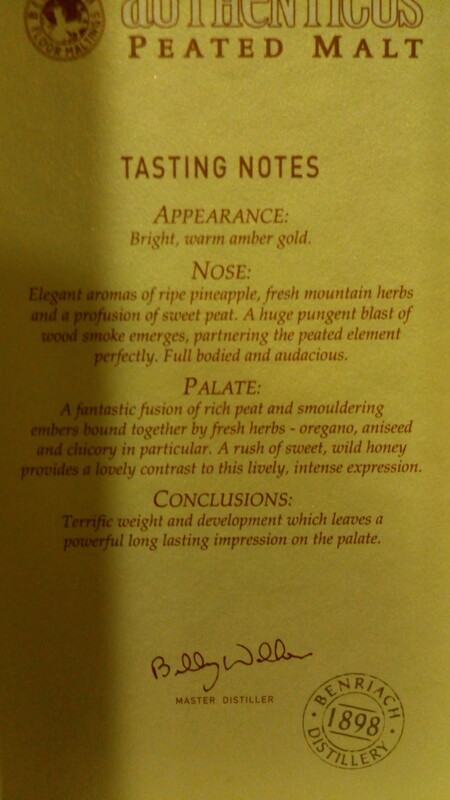 Last in our “Peat Unusual” evening was the beauty that inspired the evening in the 1st place! To recap, the goal was to sample peaty whiskies – other than Islay – that did not neatly follow conventional expectations of a Peaty dram. Alas my notes from that evening were waylaid… however I had an opportunity to share a few remaining drops in another occasion… so what follows are those impressions. Overall we found it to be a brilliant dram. Complex, nuanced, mature and having a sophistication few whiskies achieve. To put it mildly, this whisky was in a completely different league than the others. 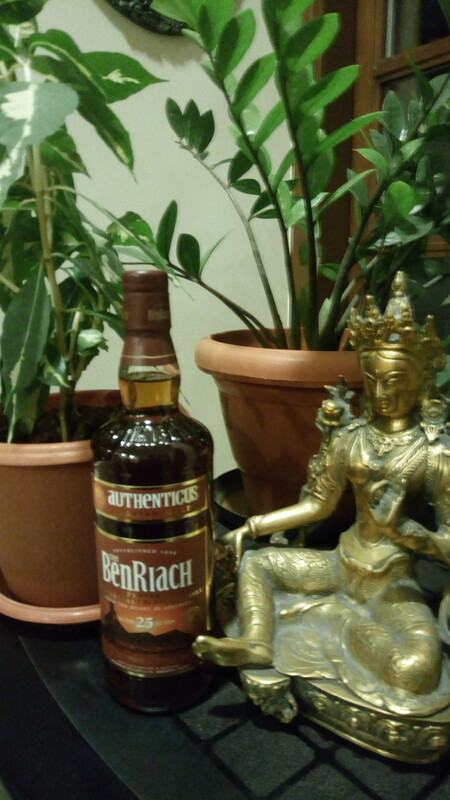 And what do the folks over at BenRiach have to say? Appearance: Bright, warm amber gold. Nose: Elegant aromas of ripe pineapple, fresh mountain herbs and a profusion of sweet peat. A huge pungent blast of peat smoke emerges, partnering the peated element perfectly. Full bodied and audacious. Palate: A fantastic fusion of rich peat and smouldering embers bound together by fresh herbs – oregano, aniseed and chicory in particular. A rush of sweet, wild honey provides a lovely contrast to this lively, intense expression. Conclusions: Terrific weight and development which leaves a powerful long lasting impression on the palate. I know this whisky was picked up at The Whisky Exchange in 2016 where it can be purchased for approx 225. I was impatiently waiting for the appropriate occasion to try… what a wonderful evening of seated whiskies. 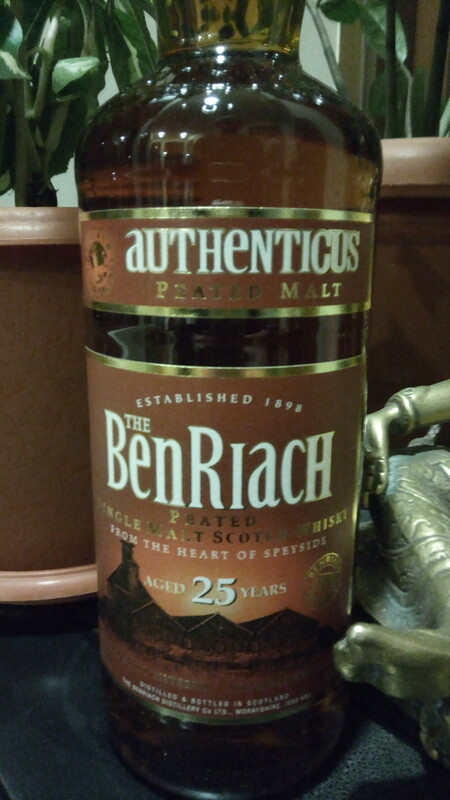 This entry was posted in Scotland, Speyside and tagged BenRiach, BenRiach 25, BenRiach Authenticus by Carissa Hickling. Bookmark the permalink.